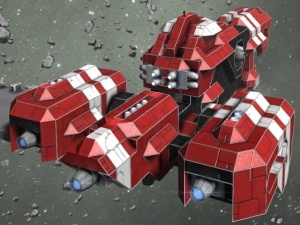 Red 1 or just Red Ship is a pre-fabricated ship, usually seen on many of the Easy Start maps and commonly featured in various official videos. The updated newer version of this ship has numerous features and facilitates making it suitable as general purpose relatively light carrier. Generally well armored, especially the front. Surprisingly maneuverable with 34 Thrusters in all directions - 2 large thrusters forward, 2 large+5 small thrusters backwards, 1 large+8 small thrusters upwards, 8 small thrusters downwards, 1 large+3 small thrusters right and left. A fully functional cargo bay with airtight doors and connector port. 2 batteries for emergency power. 1 Gatling Turret, 1 Missile Turret and 1 Rocket Launcher at the bow (all connected to conveyors). 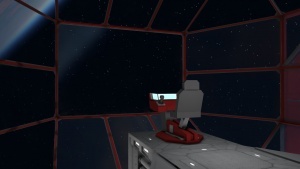 A fully pressurized interior with artificial gravity. A fully conveyor accessible inventory. A Medical Room on the upper deck, with numerous seats. 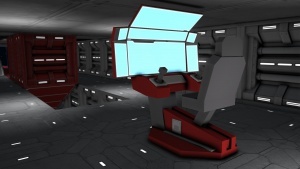 Two functional Bridges: an exposed observation deck bridge with Flight Seat for first person located on the upper deck and at the front and a more protected Control Station located deep within the ship on the lower level. Antenna and Beacon allowing easy radio communication. 10 Gyroscopes for easy maneuvering. Many Cameras in all directions for widespread visibility and awareness. Many Connectors and Collector points for versatile docking. This page was last modified on 26 March 2016, at 13:03.